Earlier today, we published a complete preview of what to expect from today's FOMC announcement, and how to trade it. Now courtesy of Goldman, here is a proposed red-line statement that lays out what the Fed is most likely to say today (see bottom of post). But first, recall that in order to justify its "powerful dovish pivot", the Fed will have to trim its economic outlook for 2019 and perhaps 2020 (while naturally blaming "external factors"), but not too much, lest traders panic about the economy. 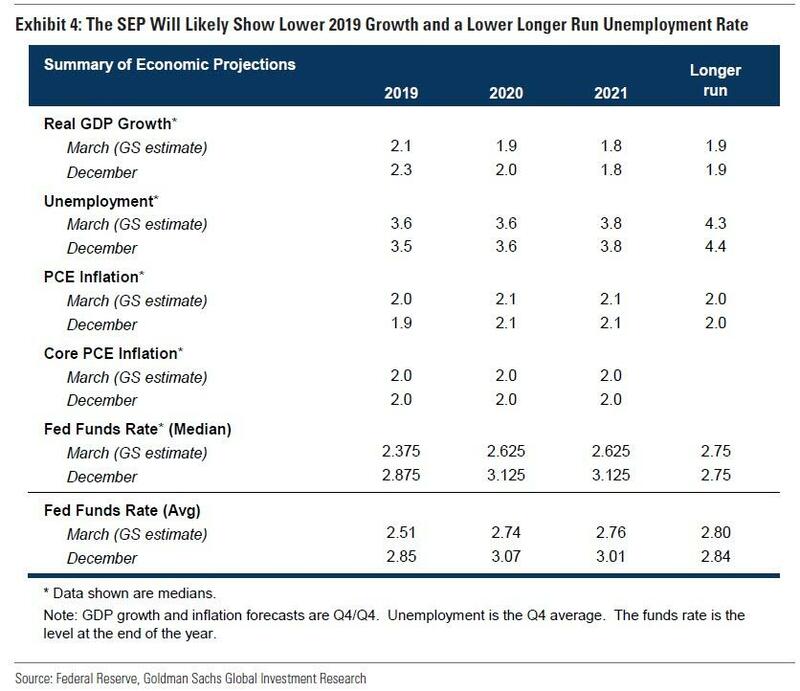 As a result, Goldman said that it expects only modest changes to the Committee’s economic projections, and believes the 2019 growth forecast will decline two-tenths to 2.1%, and the 2020 forecast is likely to decline one-tenth to 1.9%. The bank's unemployment rate forecast for 2019 is likely to move up a tenth to 3.6%, while the longer run unemployment rate is likely to once again move down a tenth to 4.3%, narrowing the projected peak labor market overshoot by two-tenths. Then there are the dots: as we explained this weekend in "For The Fed, Humiliation Arrives At 2pm On Wednesday", with much of the Fed’s dovish shift coming at the non-SEP January meeting, the dots have quite a bit of catching up to do. The December dots showed a median projection of 2 hikes in 2019, 1 hike in 2020, and no hikes in 2021, for a terminal funds rate of 3-3.25%. In March, Goldman expects the median dot to show just one hike over the forecast horizon, most likely in 2020, for a terminal funds rate of 2.5-2.75% (note that only one participant would have to shift for the median to instead show an alternative path for rate hikes in 2019-2021 such as 1-0-0 or 0-1-1). Meanwhile, the market has already priced in significant odds of a rate cut in 2019 and even higher odds in 2020, suggesting that even a slightly hawkish bias to today's statement could lead to a prompt plunge in markets as traders are once again forced to trigger the Powell Put, which will only happen with the December lows getting revisited. The statement is likely to downgrade the growth pace to “moderate” and note that job gains slowed last month. The description of consumption will likely be downgraded to “moderated” too in recognition of the weak December retail sales data. No changes to the other paragraphs are expected, and the blacklined result will look as follows.